Summary: Buffy discovered that Spike was alive in L.A. and has been helping with the cleanup. They, of course, inevitably got back together, and now, they’re on their first road trip together. Third person POV. Set post-NFA. A/N: Special thank you to badwolfjedi for brainstorming road trip fic ideas with me (couldn’t decide when and where to set it) and for reading over the story to make sure I didn’t do anything way off base. And this story is dedicated especially to dear swifthorse. Author Note: This is the first chapter of the ROAD TRIP in this story (chapter 5 of the story overall). You can read the preceding chapters here on EF . If you don’t want to do that, you don’t need to! I’ve included a short setup summary at the start. Apologies for what probably seems like a horrendous crossover with teragramm, but I really am posting everything after midnight my time! I wanted to write something original for round 25 of seasonal_spuffy, but I’ve also just finished a brand new, never-been-published story. So I decided to post both. Time travel is a kind of road trip, right? For my last post of the day, below the cut, I have 2 printable bookmarks (one vertical, one horizontal). I “borrowed” the bookmark idea (with her permission) from emmatheslayer. * Enjoy! Below the cut find three “Road Trip“ Fiction banner. If you would like a banner personalized or resized, just ask! Enjoy!! Creator Notes: When I saw the theme of this round was going to be Road Trip – I HAD to do a couple moodboard/aesthetic/story boards and this story came to mind. It is a wonderful Season 5 story by the lovely and uber talented Gort and is worth reading again and again, even as a permanent WIP, as the place it leaves off is kinda like a starting point for us readers to imagine what happens next. 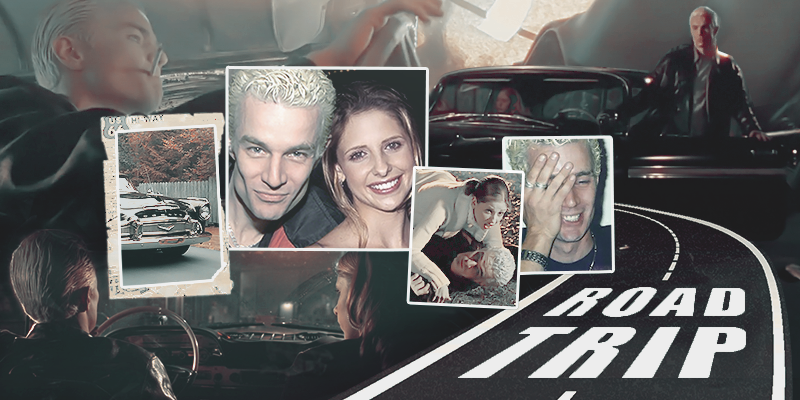 The author put as “you can imagine a Spuffy roadtrip that goes on forever!” – and that sounds pretty great, right? So please read and comment if you like (while respecting the author’s permanent WIP status of this fic). Creator Notes: Did you ever want to see some more alone time for Spuffy in Season 7? Well, I sure did. One of the reasons I love this fic by the amazing Sandy_S, we see some real discussion and lovely quiet moments away from the house full of people who recently threw Buffy out. Summary: Spike might just have found something that can make Buffy smile. A/N Thank you to my beta, darcygall. Summary: Lorne needs to get out of LA. Spike has a car and no reason to stay. Can this Odd Couple survive the road trip from hell? And will Buffy ever catch up? Takes place after Not Fade Away, comics do not exist. Rated R for foul language and sexual situations. A little pretty I threw together for Free for All day. Use however you want. So, instead, I lifted the format off of something unrelated to recs that OffYourBird did in the Elysian Fields Facebook group, and I mapped the settings of some Spuffy fic I have recced in the past. For example, “One Gazelle in All the World” by baphrosia takes place in the Serengeti, so I stuck a pin in Serengeti National Park and put the fic title and author in the description. Notes: It’s already Sunday where I live, so it’s our second free-for-all day, and I’m here with my artistic vision of season 6 as a kitten cuddle pile! Okay, that’s only the second banner. The first is romantic but not happy. Both banners are based on the lyrics of “Counting Stars” by OneRepublic, and mayybe I wanted to try song-inspired artwork because of that cool challenge on BuffyForums. This is banner number three and four that I have ever made in my life. I’m having a ton of fun figuring out how you even edit an image. *g* Concrit would be welcome! My contribution is a vid about Buffy and Spike’s relationship dynamics in Season 6. Warning: it’s Season 6, so don’t expect anything happy or romantic.